Hey Everyone, just wanted to show you this cool pose prop that will be available from ::WetCat:: . The prop is a snow mound that comes with two different pose styles, snowboarding and ice climbing. Each style has a few poses to choose from. 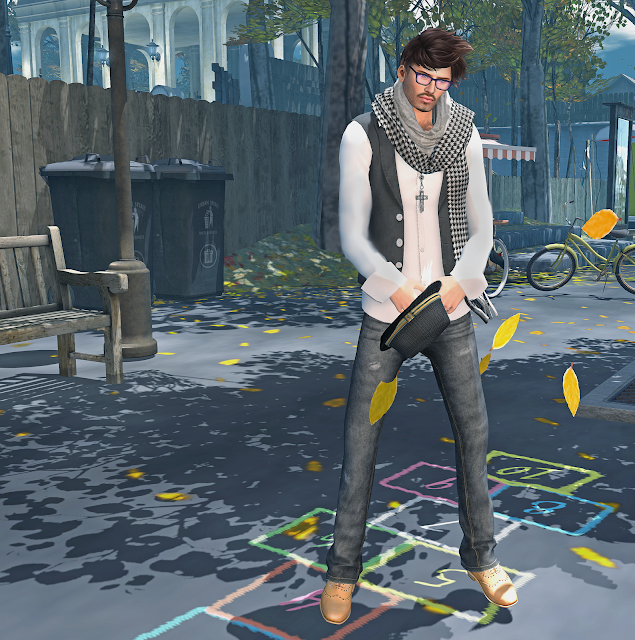 You can purchase this prop at Winter Trends SL, which runs from December 1st to 14th. Hey Everyone, just wanted to pop in and show off the new classic suit from Zaara. Each colour comes with a variety of shirt and tie textures to choose from. The hud is also very well structured and easy to use. In my opinion, its's one of the best suits currently available. Happy Sunday all. I woke up early this morning and felt inspired, while listening to Switchfoot. Music gets me through many things, good and bad. Figured it was best to capture that moment. Hey Everyone, I put this outfit together yesterday, for the new Knit Jacket from Gabriel. Also used the recent shoe release from Valiant, which is available at the current round of C88. Snapped the picture at Kaelyn Alecto's , It All Starts With A Smile. She is currently still working on the build, but I snapped this at the landing point. Great place if your looking for a place to take fall pictures. Ever get that moment, when your just constantly in a really good mood? It's how I have been the past couple days. Just relaxing, listening to music and it's got me into the rhythm of wanting to put outfits together. Been on this kick of trying to do some Johnny Deep inspired looks, so here is another. I used the most recent releases from FATEwear as the base, so most of the clothing meshes really well and doesn't overlap. Hey everyone, I put this outfit together with some newer and older releases. I have been out of the game for a while, so it's all new to me. I am thrilled that Wavie Haller decided to re open his clothing store Valiant. When I first joined second life, his clothing store was one of my favourites. Nice to see him back in the men's fashion fold. I snapped this picture at Neva Crystal's Sky Village. The place is absolutely gorgeous and I recommend visiting . Click here for your tp. Hey Everybody, it's been quite a while since I last made a post. My computer had been acting up and I am just now getting it fixed, well sort of. Its working better, regardless. Just wanted to show the new male mesh avatar from CheerNo. I have been pretty sceptical about mesh shapes and body's, but this creation is quite fun to play with. Looks great from most angles and is a nice change from the typical second life system shape.